Empanadas, also known as turnovers or hand pies, are perfect as snacks or appetizers and can be filled with anything you can imagine. This flaky pastry treat is of Spanish origin and quite famous in many Latin countries and some parts of US and Southeast Asia. The Filipino version has semi-sweet dough filled with ground meat, diced potatoes and carrots, peas, raisins, cheese, and boiled eggs. It’s either baked or fried. I first learned how to make empanada during my high school culinary class, and later on adjusted the recipe to suit my taste. 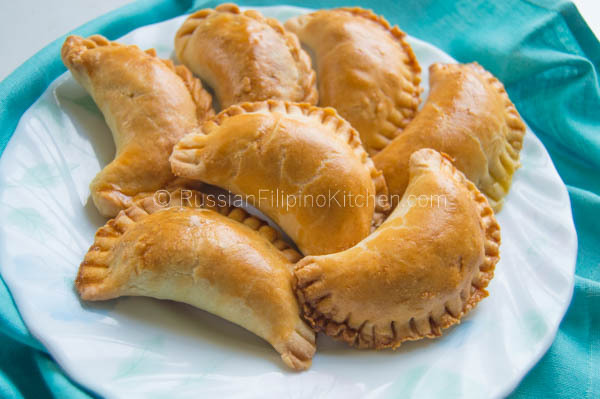 This recipe is for baked Filipino beef empanada. It seems intimidating at first to make the dough (many people including myself thought so) but once you get the hang of it, it is actually pretty easy. Since I have small kids at home, I am making smaller empanadas to fit tiny hands easy for them to consume. You can make bigger ones of course depending on the cutter you will use. Just adjust the baking time and pay close attention to prevent them from burning. 2. Remove dough from refrigerator and unwrap plastic wrap. Cut dough in half and work on each half one at a time. 3. Sprinkle flour on a clean, flat surface and flatten dough using a rolling pin. Make it as thin as possible. 4. Use a round cookie or donut cutter, a small bowl, or a cup to cut out discs from the dough. I used a drinking glass on this one that’s 3 inches in diameter. If you want bigger empanadas, use a bigger cutter. 5. Remove discs and pile up on one side, and set aside excess dough cuttings. 6. Place empanada disc on your palm and place enough empanada filling on the center. 7. Use your fingers to fold in half towards the edges and pinch the sides to close. 8. Use a fork to seal the sides tight. I find this method much easier and more effective in sealing smaller empanadas. 9. Another way of sealing the empanada is to pinch and fold the sides. This adds visual appeal and works best for larger empanadas. Watch this video link to see how it’s done. 10. Repeat steps 5-8 to stuff and seal more empanadas until you used up the round discs you have. To make more, shape the excess dough cuttings into a ball, flatten with your hands, and roll out thin using a rolling pin. Use a round cutter to cut out more discs. Work with the second half of the refrigerated dough until you’re finished cutting, stuffing, and sealing. 11. Place empanadas in a single layer on a baking sheet lined with parchment paper. 12. Make an egg wash by beating an egg in a small bowl. Brush each empanada with the egg wash to make them shiny and brown after baking. 13. Place baking sheet on center rack inside the oven and bake for 18-20 minutes. Empanadas are done when they appear light brown and shiny. 14. Remove from oven and allow to cool before serving. • Use unsalted butter for this recipe. If you have to use salted butter, omit the salt. You don’t want your pastry dough get too salty. • Work as fast as you can when working with the dough (cutting, stuffing, and sealing) as the more you handle them, the butter in the dough melts. You will notice the dough gets oily and softer. If this happens, place the dough in the freezer for a couple minutes until they harden a little before proceeding. In a large bowl, mix flour, baking powder, salt, and sugar. Add butter slices into the flour mixture and using your fingers, slowly incorporate butter into the mixture until it resembles coarse bread crumbs. In another smaller mixing bowl, beat the egg and mix it with ice cold water. Add wet ingredients to dry ingredients and mix until you form a dough. Lightly sprinkle flour onto a clean, flat surface and transfer dough. Form into a ball, cover with plastic cling wrap, and refrigerate for at least an hour. Chilling the dough makes it easier to work later on. Brown ground beef on a skillet on medium high heat for about 3-4 minutes. Remove excess oil, leaving only about 2 tablespoons of fat for sautéing. Throw in onions and garlic and sauté until garlic has browned a little and onions are translucent, about 2 minutes. Add in the diced carrots, potatoes, green peas, and raisins. Saute for a minute or so until slightly softened. Season with tomato sauce, soy sauce, salt, and ground black pepper and mix. Cover skillet and adjust heat to medium low. Allow the vegetables to cook for 10 minutes, stirring 2-3 times in between. To check for doneness, pierce carrots and potatoes with fork or knife. Remove dough from refrigerator and unwrap plastic wrap. Cut dough in half and work on each half one at a time. Sprinkle flour on a clean, flat surface and flatten dough using a rolling pin. Make it as thin as possible. Use a round cookie or donut cutter, a small bowl, or a cup to cut out discs from the dough. I used a drinking glass on this one that’s 3 inches in diameter. If you want bigger empanadas, use a bigger cutter. Remove discs and pile up on one side, and set aside excess dough cuttings. Place empanada disc on your palm and place enough empanada filling on the center. Use your fingers to fold in half towards the edges and pinch the sides to close. Use a fork to seal the sides tight. I find this method much easier and more effective in sealing smaller empanadas. Another way of sealing the empanada is to pinch and fold the sides. This adds visual appeal and works best for larger empanadas. Watch this video link to see how it’s done. Repeat steps 5-8 to stuff and seal more empanadas until you used up the round discs you have. To make more, shape the excess dough cuttings into a ball, flatten with your hands, and roll out thin using a rolling pin. Use a round cutter to cut out more discs. Work with the second half of the refrigerated dough until you’re finished cutting, stuffing, and sealing. Place empanadas in a single layer on a baking sheet lined with parchment paper. Make an egg wash by beating an egg in a small bowl. Brush each empanada with the egg wash to make them shiny and brown after baking. Place baking sheet on center rack inside the oven and bake for 18-20 minutes. Empanadas are done when they appear light brown and shiny. • Work as fast as you can when working with the dough (cutting, stuffing, and sealing) as the more you handle them, the butter in the dough melts. You will notice the dough gets oily and softer. If this happens, place the dough in the freezer for a couple minutes until they harden a little, before proceeding. At a recent cousin get-together, we had Chicken Empandas. So delicious. Can’t wait to try these . . . Thank you Alice! I followed your blog as well. You have fantastic recipes. Can’t wait to try them. love love love these empanadas. I grew up as a child in the Philippines so I enjoy their food. Thank you! Thank you for this recipe. I like cooking and always look for new recipes. I have small question. Can I fry the empanadas? Hello Mariam! This recipe is specifically for baked empanadas. I will post in the future another recipe for empanada that you can fry. Your empanadas look amazing! Can’t wait to try them. I would also like to freeze them & reheat for lunches or snacks for my kids. Can I freeze them in the unbaked state? Or freeze them after they are baked & cooled. Hello, Jane! Thanks…I actually haven’t tried freezing them yet as I make a fresh batch every time and bake them right away. However, I’ve tried making similar dumplings like this Russian-style and we freeze them before cooking. I don’t see a problem if you want to freeze them prior to baking and also afterwards. You may have to increase the baking time though. Hello Maine! Yes, you definitely can. I don’t have any tomato sauce. Will ketchup work as a substitute? Yes you can, although it’s going to be a little bit sweeter. Mia, i can not wait to try our recipe of baking them as i fry mine.. will give you an update on how my trial will turn out.Thanks !